Alan Rabinowitz knows tough. The director of the Wildlife Conservation Society's science and exploration program, Rabinowitz made his bones as a young zoologist who would go anywhere to map the shrinking habitats of big animals. He's endured 500-mile hikes through pure jungle, survived malaria, leech attacks, shaky flights on questionable airlines and virtually every other threat that comes from walking the wild parts of the world. His physical bravery earned him a movie-star nickname  the "Indiana Jones" of wildlife science  and even at 53, the muscle-bound Rabinowitz looks like he could wrestle a boa constrictor, and win. But when it comes to saving wild animals, what really sets Rabinowitz apart is his patience. Like a roving international diplomat, the wildlife biologist has tirelessly lobbied foreign governments to set aside land to protect endangered species  especially big cats like jaguars, mountain lions and tigers, whose numbers in the wild dwindle every year. Starting in Belize in 1984, when he talked the government into creating the world's first ever jaguar preserve, Rabinowitz has emerged as the global spokesman for big cats, a scientist willing to talk to anyone, at any time, in the service of animals. 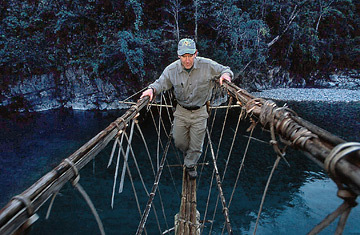 His mentor, the great naturalist George Schaller, has said that Rabinowitz is "superb at finding local solutions to conservation problems," in part because the Brooklyn-born scientist knows that wildlife will be safe only if the governments of the world, including the developing the world, come to see that conservation is in their interest. Over the years, that's meant Rabinowitz has occasionally had to negotiate with less than savory characters  no more so than in his most recent and crowning accomplishment, the establishment of a 8,452 sq. mi. (13,602 sq. km) tiger reserve in the northern jungles of Burma. The military junta that has ruled the nation since 1962 is among the most oppressive governments in the world, one regularly accused of human rights violations, and Washington maintains harsh economic sanctions against the regime. But for more than a decade Rabinowitz has traveled back and forth from Burma  which the junta now calls Myanmar  meeting with everyone from high-level generals in the former capital of Yangon to local rebels in jungle camps, all in a painstaking effort to create and preserve the Hukawng Valley Wildlife Sanctuary. Rabinowitz makes clear just how painful the process was in his new book, Life in the Valley of Death. (Watch Alan Rabinowitz talk about the Hukawng Valley reserve, and the changing nature of wildlife conservation, on the new video Greencast.) First there was the forbidding Hukawng Valley itself, a remote chunk of mountainous jungle on the border with India, dubbed the "Valley of Death" by British refugees fleeing the Japanese advance into Burma during World War II. When Rabinowitz hiked deep into the Hukawng in 1999  braving carnivorous leeches, among other trials  he was the first scientist to visit the area since the early 20th century. Tigers were once numerous in the valley, but poaching and human population growth had reduced their numbers to perhaps a few hundred. Gold had been discovered in the valley, and Rabinowitz knew that if the government didn't act soon, tigers would soon be hunted into extinction in Burma. He also knew that by protecting the tiger, he could save far more wildlife than just the big cat. Following in Schaller's footsteps, Rabinowitz has focused on protecting cats partially for public relations reasons  it's easier to rally public support behind such beautiful, charismatic animals than, say, a new species of frog. Also, because big cats range far and wide in their habitats, if you can stake out enough land to protect them, you'll also be protecting all the smaller animals that occupy the lower rungs of the food chain. (It's called the "apex protection" strategy.) Tigers will likely always remain endangered in the Hukawng Valley, but turning the area into a well-protected reserve would safeguard one of the world's great remaining biodiversity hotspots. As wildlife reserves grow in size, however, they need to change. Pristine sanctuaries without human interference are simply impossible  endangered animals and people need to learn to live with one other. In the Hukawng Valley reserve, which would eventually grow to an area the size of Vermont, that meant Rabinowitz needed to enlist the help of local people. Over years of meetings, he managed to convince many of them to stop hunting tigers and the wild game that is the animals' main source of food. At the same time, Rabinowitz didn't stand in the way of some economic development in the valley, realizing that sustained poverty would only exacerbate the threat to the tigers. It's a delicate balance always in risk of being overturned, but while the reserve remains in harmony, the benefits to an uneasy land like Burma are enormous. "Animals and conservation can do more to bring together disparate cultures, ideologies, and social classes than any political oratory, pounding of fists or aggressive actions by individuals or between nations," Rabinowitz writes. Today the reserve is virtually complete, and he hopes that over time tiger numbers will strengthen  and the Hukawng Valley will be seen as a model for future conservation efforts. None of this would have happened, Rabinowitz says, without the determined support of the generals he spent years courting. Because of his willingness to work with the junta, Rabinowitz has emerged as a prime target for the free Burma community, which believes that any engagement with the generals only legitimizes a cruel military regime. While the charge especially stings in the wake of last fall's brutal military crackdown of Burmese protesters, Rabinowitz is unapologetic about his work with the junta, knowing their cooperation was the only way to ensure the reserve would be protected. And he's right  as distasteful as it must be to work with the government, refusing to speak to them would have left the tigers of Burma on their own, defenseless. On this issue, at least, engagement yields far more than isolation  and Rabinowitz deserves credit for a political courage no less real than his physical bravery, for being willing to sit down with the devil, occasionally, to save a tiger.